In honor of yesterday’s celebration of fellow fathers, I am reposting a link to the post I wrote last year about the puzzling apostrophe in Father’s Day. Or is it Fathers’ day? This page is the most visited on my blog with over 200 hits this week alone (a record for me! ), and has sparked a lively set of comments. Do add yours! For the record, I spent a wonderful Father’s Day (my preference) playing with my son at the shore (not the “beach” or the “coast,” by the way in these parts) and I am now busy revising my new grammar textbook, due out some time next year. More blog posts coming soon, I hope. How offensive! Fathers are parents, too. I have returned the letter in the pre-paid envelope with a message to this effect. 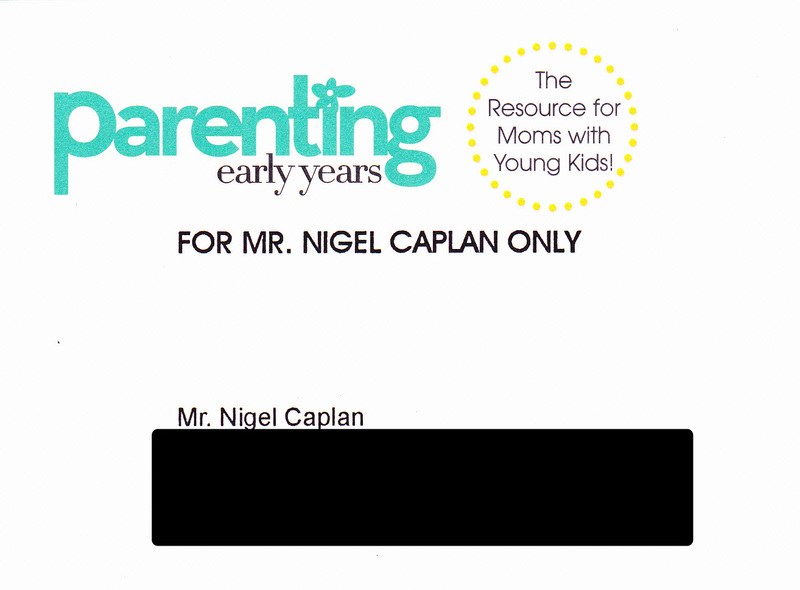 It’s tiring to see products and store flyers that only show mothers with young children, and irritating to see toy boxes with lists of reasons “why moms like this”, but to receive a personalized invitation that implies I do not/cannot/should not take care of my own son is insulting and inaccurate. So, dads, it’s time for us to burn our swaddling cloths in the street and demand equality! That’s not a trend I’ve ever noticed when teaching Japanese students — any truth in it? It is striking that mumbling is a private act, so even if twitter.jp users are not exactly talking to themselves, they are at least talking quietly and unobtrusively. Compare that to the English “tweet” and “twittering,” which suggests to me a rather louder, more irritating sound. Ending Japanese sentences with “nah-woo” — an adaptation of “now” in English — is hip, showing off the speaker’s versatility in pseudo-English Twitter-speak. (Here‘s a detailed blog posting about this neologism.) It’s not surprising to me that technology has caused new words to come into Japanese, or any language, but I’m curious that the Japanese have calqued (to use the technical word) an English adverb, rather than a noun or verb. For example, German borrowed der Computer, and even French has l’Internet (attempts to translate the word literally using webs and nets never caught on). So, I would have expected the word Twitter (or even Tweet) to crop up — although wouldn’t those words both be very hard to fit into Japanese phonology? And doesn’t Japanese already have a word that expresses the English now? Does its (apparently) word-final restriction mean anything? Japanese linguists, please help out! A contemporary example of the verbing of trademarks is Google — so far, at least, when people talk about “googling” something, they seem to mean “searching using Google.” Of course, as with Xerox, there’s always the chance that the verb will become generic so that it would make sense to google someone on Yahoo or Bing (the lawyers in the Googleplex are very aware of this potential problem). (I also found it on their promotional website, shown on the left, but with Decide capitalized.) Since decide is obviously an imperative verb here, by parallelism, so is Bing. (Have you heard anyone saying “Oh, I’ll just Bing it” yet?) Is this an attempt to compete with Google on grammatical grounds? Or is Microsoft playing with linguistic fire? Remember how hard Xerox is trying to kill the verb to xerox and the noun a xerox? Author Nigel CaplanPosted on April 26, 2010 April 27, 2010 Categories Language and societyTags bing, google, trademarks, verbingLeave a comment on Googling and Bing…ing?